In a city that loves a parade, New York’s Easter Parade is a one of a kind spectacle. 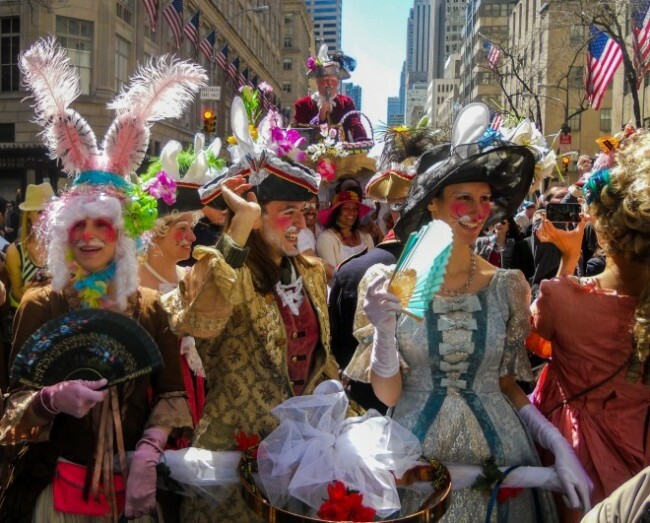 Neither a typical parade or a sacred rite, the Easter Parade is an informal procession on Manhattan’s Fifth Avenue in which participants display their Easter finery; most notably Easter bonnets. During this joyous street party, New Yorkers come together in colorful costumes to celebrate springtime. 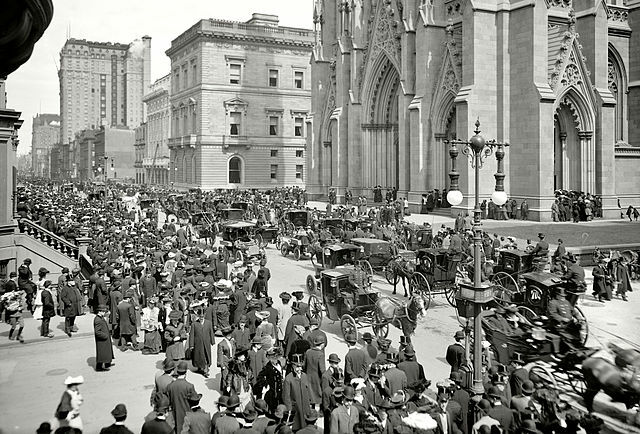 The Easter Parade began in the 1880s when the denizens of posh “Millionaire Row” (Fifth Avenue in the 40s and 50s) left Easter services at grand churches like St. Thomas Episcopal and St. Patrick’s Cathedral and took to the avenue. Promenading in their elegant new Easter outfits, the purpose was to “see and be seen,” displaying one’s affluence and style. A particularly impressive look could land one in the newspapers’ society pages. By the turn of the 20th century, extravagant ladies hats became a focus, often broad-brimmed and trimmed with ostrich feathers, flowers, and stuffed birds. As the annual tradition continued, New Yorkers began gathering along the avenue to watch the elite strut their stuff. Milliners and dressmakers from all over the country, especially the Lower East Side, flocked to make sketches of the haute couture. Like today’s Oscar fashions, department stores produced copies for sale as quickly as possible. The Easter Parade reached its peak in the mid 20th Century when massive crowds gathered to watch the spectacle. However like the city, after WWII the Easter Parade experienced decades of decline. In the 1990s the Easter Parade began a resurgence when whimsical elements started appearing. Today, beside the traditional elegant finery you’ll find colorful costumes, street performers, costumed pets, music and impromptu dance parties. But the special attraction are the over-the-top Easter bonnets covered in flowers, Easter eggs, bunnies, candy, and other symbols of Spring. Folks from all over the world converge to take part in the festivities. 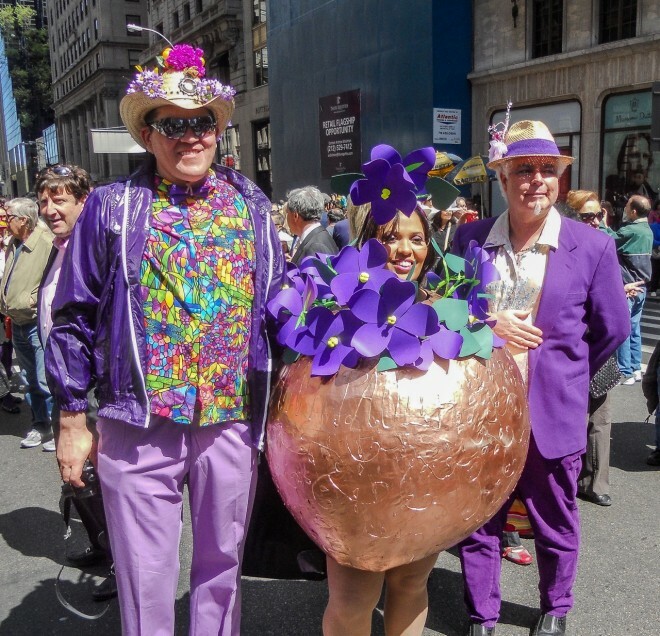 The Easter Parade takes place Easter Sunday (April 5, 2015) on Fifth Avenue from 48th – 57th Streets, approximately 10am – 4pm. There’s no specific organization for the event, and anyone is welcome to join in the fun. Long-time New Yorker Irving Berlin celebrated the local tradition in his 1933 musical revue “As Thousands Cheer.” As the Act One finale, the song “Easter Parade” recreated a scene from the turn-of-the-century “Rotogravure” outside St. Patrick’s Cathedral. The song became a classic, and inspired the movie musical of the same name. In the climax of the film, Judy Garland admits her love for Fred Astaire by presenting him with a chapeau (Easter bonnet), and the happy pair stroll Fifth Avenue in the Easter Parade. 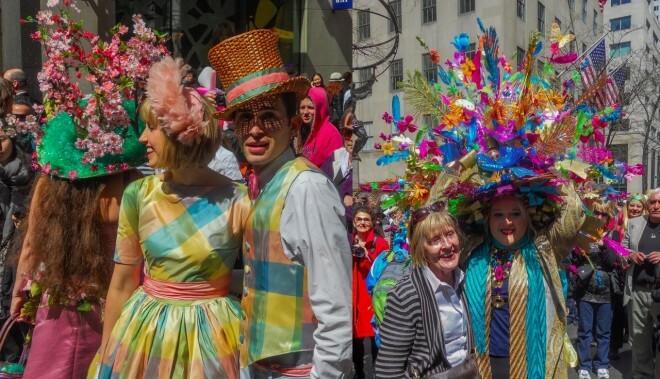 Have you been to New York’s Easter Parade? Tell us about your experience in the comments below. 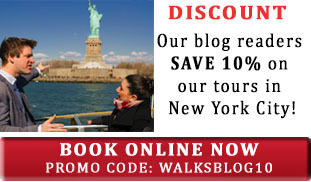 Great article!NYC has the best parades! Thanks! Hope you get to make it to one of our crazy parades. Really brings out the kid in normally ambitious New Yorkers.